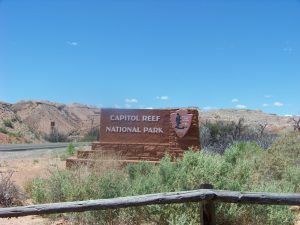 Thursday May 17, day 16 – Today we toured Capitol Reef National Park. 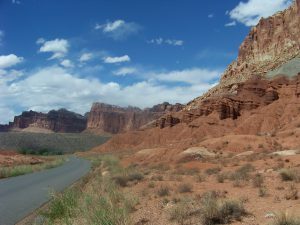 Our 6-day detour east from the route Earl and Ethel likely took through central Utah to Bryce Canyon NP took us to three national parks, one national monument, and two state parks. Each one was unique and beautiful. 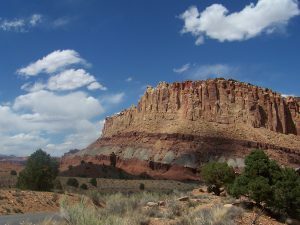 Capitol Reef NP did not disappoint either. 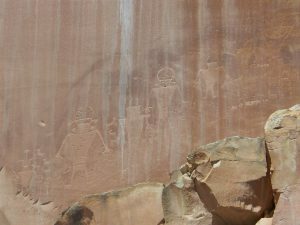 The park is very lineal (almost 100 miles long) because of the earth forces that helped to create it. But it is also vertical too. 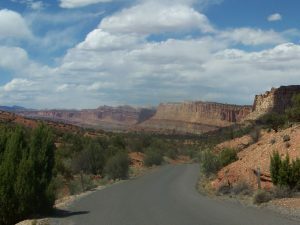 Geologists call it a monocline. We just call it gorgeous! 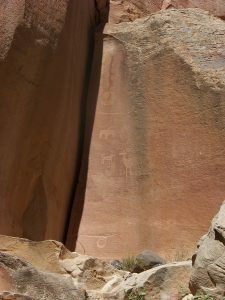 We sought out and found more petroglyphs too. Tomorrow, on day 17 since leaving home, we catch up with Earl and Ethel again on their honeymoon at Bryce Canyon National Park. Our detour added about 700 miles to the 260 mile route Carl’s parents would have taken. Every mile was worth it! Love the pioneer history here. One of my best memories was the first time we visited with Bethany. It was in September and you could pick fruit to eat for free or for canning for a fee. We picked some of the best pears ever. Some even made it home for family back there to try. The orchards are remnants of those from the Morman pioneers. Incredible pictures! Thank you for sharing. Glad you are enjoying the trip and having safe travels. Absolutely gorgeous scenery! My favorite kind of terrain. Hope you are having good weather – looks like it in the pictures.